Please see a review of the Echo PB-580H here, the Echo PB-265L here, and the Echo PB-770H here. A good rule of thumb when buying a backpack blower for home use is to take an honest look at what you need it to do.While every dealer will tell you a different story, you’re probably going to gravitate toward one of two ends of the spectrum. You’ll look at a product that’s either affordable and durable or high-end and designed for maximum power. Fortunately, this is not the case with the PB-500T Backpack Blower from Echo, an American-born company with a 40-year track record of quality products. True to their high standards, the Echo PB-500BT stands out as a strong choice for a private citizen who wants to buy an entry-level backpack blower without breaking the bank. The words of the day when talking about the Echo 500T are durability and simplicity. This model is built to take anything you can dish out and do so right out of the box. For durability, the heavy-duty L frame is solid as a rock, designed to support the whole of the Blower’s weight in storage. Particularly for the seasonal user, this is a real benefit. You can easily re-pack this model in a box, store it in your garage, and place other boxes on top of it without worrying about damage. As for simplicity, you’ve got a host of features designed to make use and maintenance as painless as possible. Just like its cousin in our Echo PB-580T review, the PB-500T model focuses on delivering hassle-free experience. When the Echo PB-500T is out in the field, it performs admirably thanks to a 50cc professional grade engine, ergonomic throttle-mounted controls, and a cruise control setting. As a result, you can easily move wet or dry grass and leaves, as well as light dusting of snow, without tiring your trigger finger out. The integrated leaf guard is a nice touch as well. This makes sure that while your blower is bringing in air to operate, it doesn’t get clogged with leaves or other debris that can lead to overheating. When it’s time to change out the air filter, something you should do every so often to keep your blower running clean and efficient, the easily accessible auto-style filter on the Echo PB-500T is quick to change out. This allows even those of us who aren’t great with our hands to keep our blower working at peak performance. Like with most products, you can tell the difference between professionals and entry-level by their commitment to the little details that make our lives, and our jobs, easier. 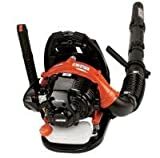 This Echo gas blower, as well as any other Echo leaf blowers in general, has those details covered. The reviews for the Echo PB-500T are mixed, but generally positive. 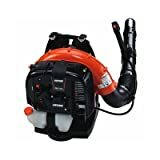 Of the positive reviews, it’s praised as an all-around solid backpack blower designed with the suburban family in mind, as well as a credit to Echo as a company. The negative reviews, however, all point to one problem. Fortunately for us, it’s quite a light issue to work around. It’s a safe bet that when the Echo Leaf Blower reviews are negative, it’s about the carburetor seizing up after sitting with fuel mix for months on end. The criticism continues with the problems that spring from its main flaw. The solution is incredibly simple on this one for the Echo Backpack Blower PB-500BT. All you have to do is simply drain the fuel on your blower at the end of the season. This way, your oil and fuel mix won’t separate in storage. As a result, your carburetor will stay fresh, and your blower will keep working well. If you’re more inclined to a mechanical solution, you can also remove the carburetor and clean it out yourself as well. With a little preventative maintenance, your Echo Blower will work just fine, no matter how often it’s used. While this Echo gas leaf blower may not be the fanciest piece of equipment you’ve ever purchased, it’s a great choice for someone who just needs to use their Blower a few times a season. According to this review, the unit is tough and simple. 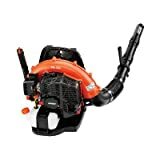 With a little maintenance and the right attachments, this Echo Backpack Leaf Blower will take care of anything you’d need a blower to do as a homeowner.